Hot-shooting Carey High School senior Jaide Parke is never far from putting up some big numbers in prep girls’ basketball action. And the 5-7 guard put together back-to-back hot nights last week. Parke (17.3 ppg) drilled a season-best 28 points including four 3-pointers as Carey avenged an early-season setback with a 49-38 home victory over the Challis Vikings Saturday. Her 18 points before half staked Carey to a 33-14 lead. Challis (3-3), which trounced Carey by 25 points at home Nov. 13, couldn’t recover from the first-half loss of point guard Rachelle Chamberlain to an ankle injury. Carey senior Morgan Parke (11.9 ppg) had 10. Friday night, Parke scored 16 of her game-high 19 points in the first half and Carey turned a 32-8 halftime lead into an easy 46-22 home triumph over a young Oakley squad (3-3). Parke matched her career high with five 3-pointers. With her big numbers as the season reaches the midway point, Parke improved her four-year career scoring to 980 points and bettered her school record to 99 3-pointers. Hampering Oakley’s effort were 29 turnovers. Parke finished the night with 19 points, 6 rebounds, 5 steals and 2 assists. Other Panthers contributors were Morgan Parke (14 points, 3 boards, 1 block), Lilly Rivera (5 points, 2 rebounds, 5 assists), Angelica Zarate (5 points, 9 rebounds, 3 steals), Ashley Durtschi (3 boards, 3 assists), Paige Koudelka (2 points), Medin Cenarrusa (1 point, 2 boards), Daphne Kirkland (2 rebounds, 1 assist) and Kylie Castle (2 rebounds, 1 block). Gretchen Hale (7 points, 7 rebounds) topped Oakley, which battled Carey to a 14-14 stand-off after the half. 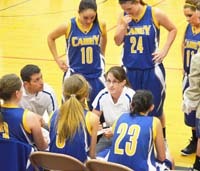 Coach Merrilee Sears’ Carey varsity (5-3, 3-1 home) finishes up its pre-holiday non-conference schedule at home playing Castleford on Friday, Dec. 14 and Shoshone Tuesday.